Virtu, the name given to a new a hybrid solar panel that simultaneously heats water and generates electricity. When solar PVC panels get hot they become less efficient. For every 1º rise in temperature they lose half a percentage point of efficiency. Thus an efficient photovoltaic solar panel has a high end efficiency rate of around 18%. However by the time it get up to 65 degrees, which is quite a normal temperature on the face of a solar panel, the panel’s down to something like four per cent efficiency. “We can create more useful energy per square metre than conventional panels on the market today. We bond the photovoltaic cells to the thermosyphon, so there is a very small temperature difference between the PVC cell and the thermosyphon. This means the photovoltaic cells are maintained at a uniform temperature”, said Simmons. 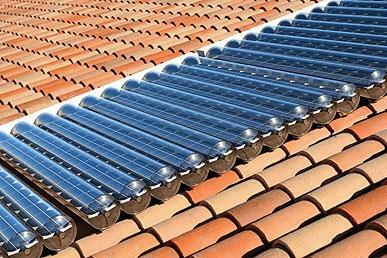 The new technology allows heat transferred away from the solar panels to heat up water. As a result of taking the heat away and cooling down the photovoltaic cell, it is possible to generate more electricity than conventional solar cells. It has been estimated that the new Virtu photovoltaic panels generate 40–45% more energy as a result of the heat transfer method which is yet another technological revolution in the solar green energy industry.